Bailleul was occupied on 14 October 1914 by the 19th Brigade and the 4th Division. It became an important railhead, air depot and hospital centre, with the 2nd, 3rd, 8th, 11th, 53rd, 1st Canadian and 1st Australian Casualty Clearing Stations quartered in it for considerable periods. It was a Corps headquarters until July 1917, when it was severely bombed and shelled, and after the Battle of Bailleul (13-15 April 1918), it fell into German hands and was not retaken until 30 August 1918. The earliest Commonwealth burials at Bailleul were made at the east end of the communal cemetery and in April 1915, when the space available had been filled, the extension was opened on the east side of the cemetery. 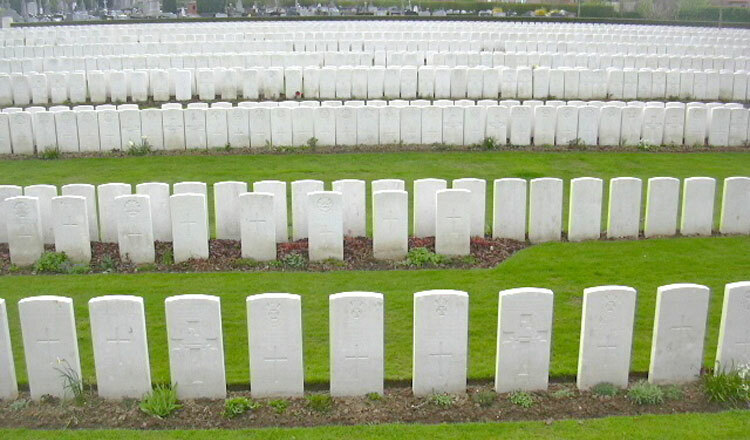 BAILLEUL COMMUNAL CEMETERY EXTENSION contains 4,403 Commonwealth burials of the First World War; 11 of the graves made in April 1918 were destroyed by shell fire and are represented by special memorials. There are also 17 Commonwealth burials of the Second World War and 154 German burials from both wars. Both the Commonwealth plot in the communal cemetery and the extension were designed by Sir Herbert Baker. In the centre of the Bailleul town is a stone obelisk erected by the 25th Division as their Memorial on the Western front, recalling particularly the beginning of their war service at Bailleul and their part in the Battle of Messines. The town's War Memorial, a copy of the ruined tower and belfry of the Church of St. Vaast, was unveiled in 1925 by the Lord Mayor of Bradford, the City which had "adopted" Bailleul.